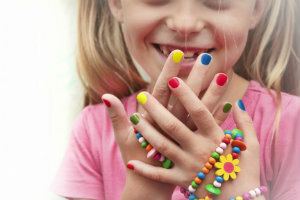 Since school is starting up again soon we thought it would be a good idea to talk about nail care and grooming techniques for you to share with your children. Some children are too young to do it on their own, so it’s important to help them out. Others are old enough to take care of their nails, but they just might not know how to do it correctly. With a little guidance they should be good to go! Keep nails trimmed. When your nails get too long they may break. If you keep them a decent length they are less likely to break off and become a problem. Trim nails correctly. Not everyone knows the right way to trim their nails. The proper technique is to cut straight across with the clippers and then file them down to your desired shape. If you trim in a curved fashion you could end up with an ingrown nail. This can lead to infection and many more problems that are best to avoid. Limit the use of nail polish remover. Polish remover is extremely hard on the nails. If you have to use polish remover try and find a kind that doesn’t have acetone on it. Moisturize. Remember that nails need to be flexible or else they might break. If you use a moisturizer on them every day you can keep them supple and strong. Monitor shoe choices. If your children are wearing shoes that are too tight they might end up with nail problems, such as an ingrown toenail or even a foot fungus. Make sure their shoes are the right size with ample wiggle room. Your children’s feet are constantly growing and changing and they need as much help and guidance as they can get to stay healthy. If you have more questions about nail care please call Dr. Peyman Elison and Dr. Viedra Elison at (623) 584-5556 to schedule an appointment at Fixing Feet Institute in Surprise, AZ.